Rather than presenting case studies as an afterthought the way other books do, each chapter was written from the ground up to seamlessly blend core concepts with fascinating real-life scenarios. Many stories take place in a clinician’s office and provide allied health students with relevant examples. Some cases feature events outside of the United States, highlighting current issues in global health. 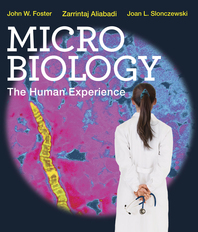 Everything in microbiology takes place at a scale smaller than the naked eye can see. With Microbiology: The Human Experience, students learn to visualize important microbial processes and structures with the support of meticulously developed, engaging, and accessible figures and photographs. Smart in-text pedagogy provides a consistent structure of learning outcomes, summaries, and thought-provoking questions. This keeps students on track with learning the foundational microbiology concepts they’ll need to know as clinicians. InQuizitive and Smartwork5 online homework systems provide meaningful practice with a variety of question types—all with detailed, answer-specific feedback and explanations that coach students while they work problems online. The structure of the text emphasizes topics allied health students are interested in while thoroughly covering the breadth of topics—medical and ecological—that you want to cover in your course.